Buckle Up, This One's A Belter! 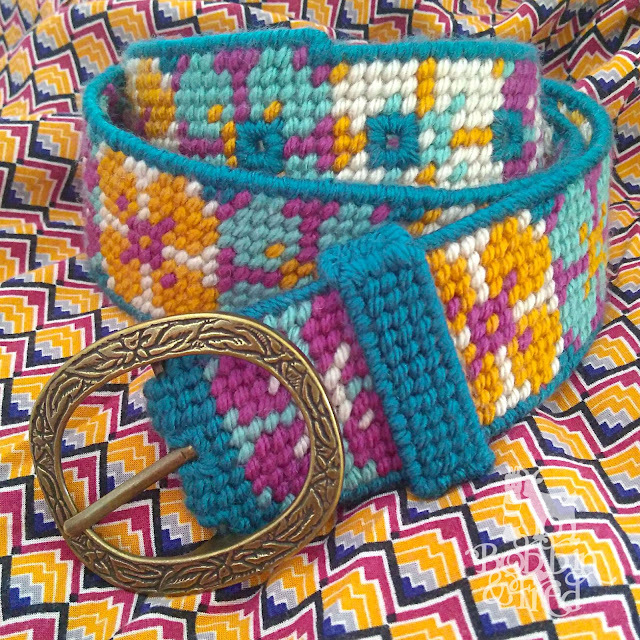 I've wanted to make a needlepoint belt ever since I saw them in a vintage pamphlet. My aim in life is to cover as many things as possible with hand stitch and being able to show off my beautiful needlework outside of the home in an easygoing way really appeals to me. 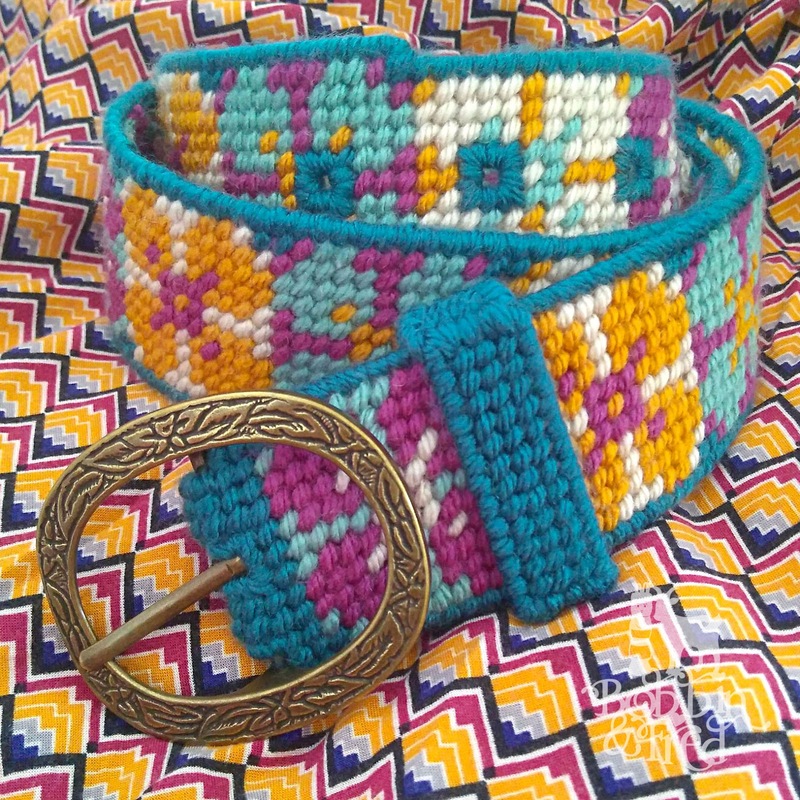 I've seen some stunning needlepoint belts in America set into leather and finished to a very high standard. They're incredibly classy and create an heirloom piece that'll be loved for years to come. 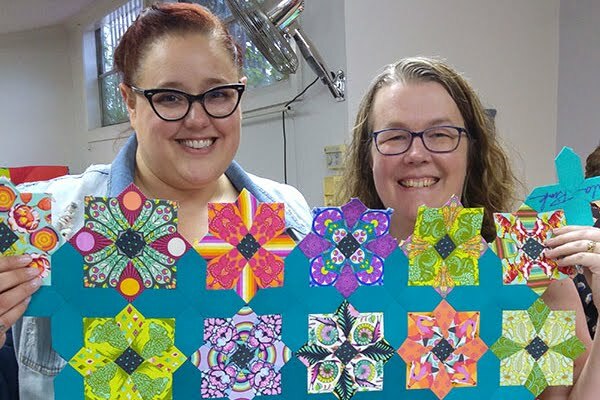 Jane of the Chilly Hollow Needlepoint Adventure says US based Hill Top Leather and MaryMac come highly recommended and after checking them out, it's easy to see why. Both achieve a flawless, high quality finish... the perfect way to showcase your needlepoint. Here in the UK finishers are far and few between and of those I've found none combine leather and needlepoint. If you know of any who do, I'd love to hear from you! I have some machine sewing skills but I've never worked with leather and so I pondered easier ways to make my needlepoint belt a reality. I stumbled across large sheets of 7ct plastic canvas that measure about 13.5x22.5" in my local craft store and realised if I joined two strips together I'd have a piece long enough for a belt! I joined the pieces in the middle at the back, overlapping them by 9 threads of canvas. If you'd like to learn how I did this check out my post: How to join two pieces of plastic canvas together and finish raw edges. I had a buckle I wanted to use, rescued from a belt I found whilst treasure hunting at a second hand sale. Unfortunately my design was too wide to accommodate my buckle and so I had to cut into the canvas to make it fit. This was really awkward and impractical and could've been easily avoided if I'd made the design the right width for the buckle shank. Lesson learnt for next time! I used a belt I already had that fit in the way I wanted this one to as a template for the holes and cut them accordingly. I had to skim some canvas off either side of the tongue end so it would fit through the buckle. I hadn't anticipated that and was desperately wishing I'd sized the design correctly by this stage. I overcast all of the raw edges and made a loop for the tongue to slide into. Since constructing this loop from four separate pieces of canvas, I've worked out a much simpler way of doing it from just one piece which I'll share with you soon. This project was very quick to sew up. I did all of the stitching in tent stitch so it was self-lining and didn't require any backing. 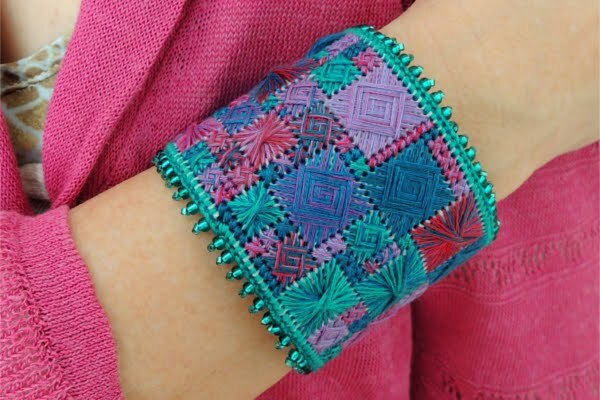 I used Stylecraft Special Chunky in shades Gold, Plum, Parchment, Teal and Sage. I was made up that Gold and Plum were a perfect match for the colours in my dress. As soon as it was ready to wear I took my finished belt for a spin by the river and the compliments flew in from strangers and friends alike! 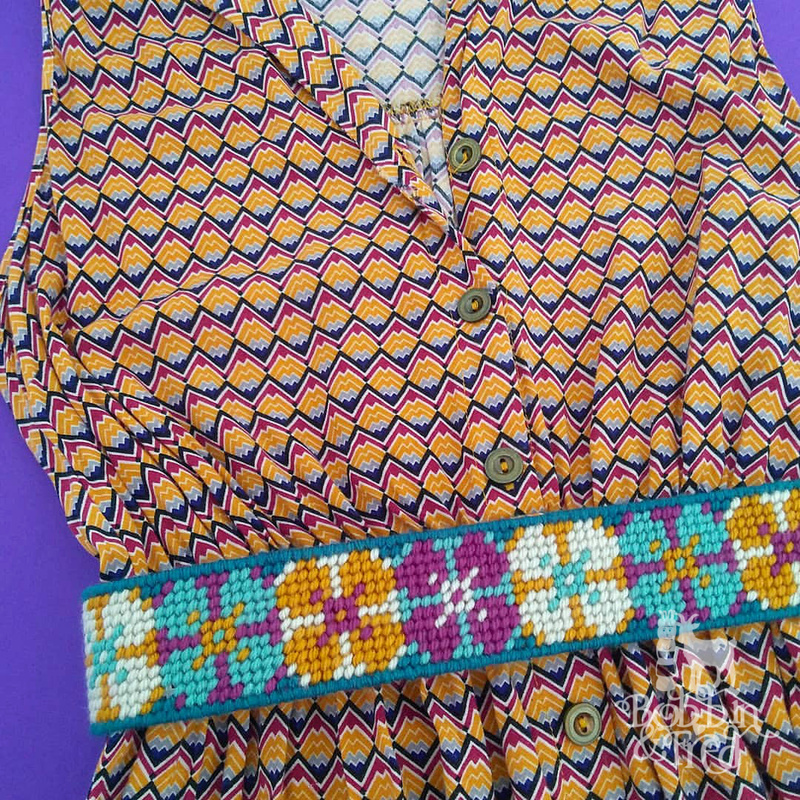 The design of my belt was inspired by the fabric of the dress I wanted to wear it with. I knew I wanted a wide belt to create an empire waist line. It sits above my hips on my waist and it isn't holding anything up or having any strain put on it. While plastic canvas seems to be suitable for this kind of minimal wear, I don't think it'd stand up to having to work harder. Next time I'll have a go at using fabric canvas with the aim of creating a more practical belt that can stand up to more wear and tear... fingers cross it's a success... I'll report back either way. 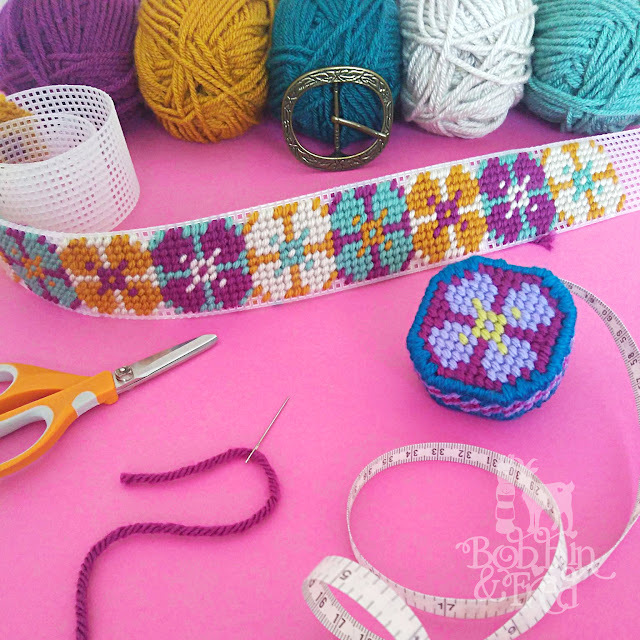 Have you made a needlepoint belt before? Did you finish it yourself or send it to a finishers? 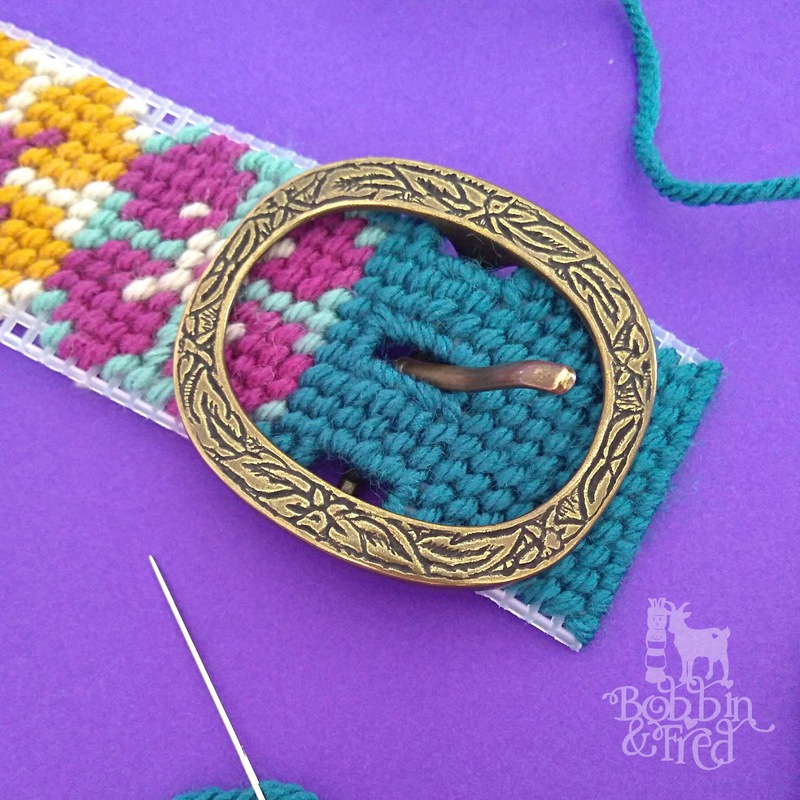 Sign up to my newsletter to keep in touch and find out when my next belt is hot off the press. Until next time, have a stitch-tastic day! I've not made a needlepoint belt but here in the USA folks swear that Hill Top Leather Shop does a fabulous job for not that much money. MaryMac does belt finishing with ribbon on the back, in case leather is a bit too expensive. That's really useful to know. 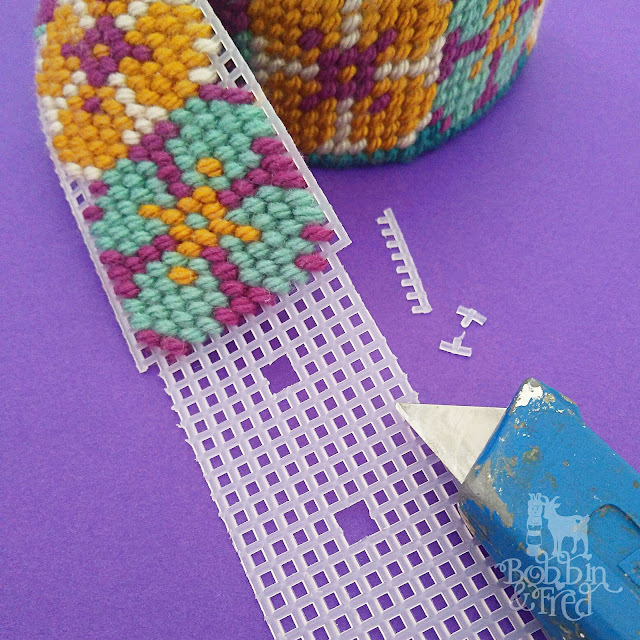 I love the idea of finishing with a ribbon on the back, that's a really nice way to do it. I'll add links to these folks in the post for those who don't read the comments :) Thank you so much.